The issue of water shut-offs in Detroit has garnered the attention of U.S. Bankruptcy Judge Steven Rhodes. The Detroit News reports, "A bankruptcy judge says thousands of Detroit water shut-offs are 'bad publicity' for the city and told the Detroit Water and Sewerage Department Tuesday to devise more ways to help residents pay their bills. ...Rhodes said the city is 'getting a reputation not only in this country but around the world' for the shut-offs — causing 'a lot of anger' and hardship among residents. In late June, three United Nations experts said Detroit’s shut-off policy may violate international human rights." The article continues, "Deputy water director Darryl Latimer was in Rhodes’ court explaining the ... department’s new policy of shutting off water to customers more than 60 days late or $150 behind in their bills. ...Rhodes asked Latimer to return Monday with further options for those who can’t afford to pay their water bill." WXYZ Detroit adds, "Judge Rhodes says the water issue is a 'solvable problem' and the city needs to make a much more aggressive plan to help customers avoid shutoffs." Yesterday, a Detroit resident asked the judge in court to issue a moratorium on the water shutoffs. WXYZ notes, "For now, the judge is not taking legal action. ...The judge said he did not know what jurisdiction he has over this issue." Judge Rhodes will preside over a five-week confirmation trial starting August 14 that will determine if the city's debt adjustment plan is fair, legal and feasible. Rhodes was appointed to preside over this trial by the chief judge of the U.S. 6th Circuit Court of Appeals. For more, please see these Council of Canadians and Blue Planet Project blogs opposing the water shut-offs in Detroit. 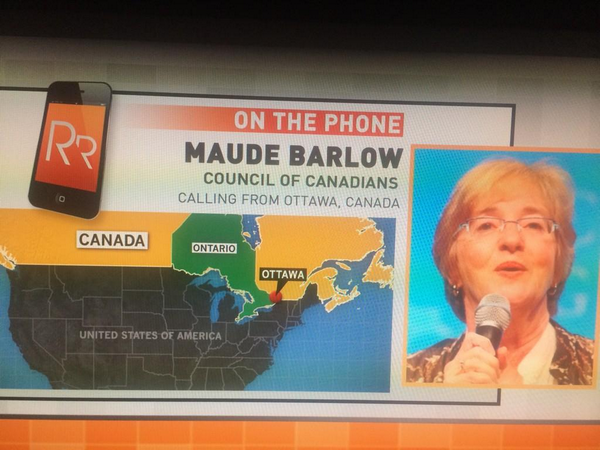 In interviews with MSNBC and the BBC yesterday, Blue Planet Project founder Maude Barlow called on US President Barack Obama to intervene to end the water shut-offs.